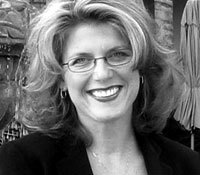 Stacy Tolos covered the world while at Vanderbilt. By the time she had received her second Vanderbilt degree in August 2007, a Master's of Public Policy in Education Policy, she had worked in Washington, D.C., West Africa, Dubai, and a high poverty neighborhood in Nashville. 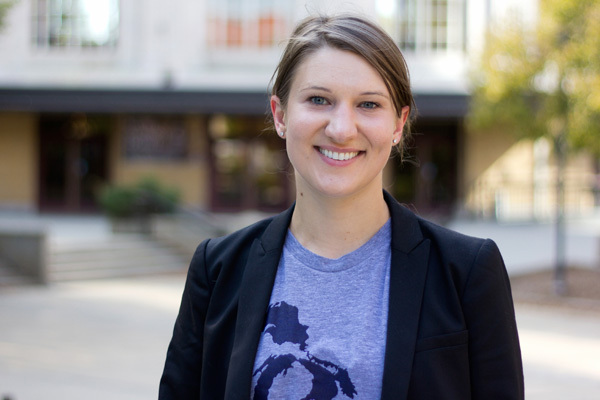 A born organizer, Stacy helped organize the Education Without Borders conference in Dubai in 2006 and used her Vanderbilt connections to invite Nobel laureate, Muhammad Yunus to give the keynote speech. As a freshman, she started Synergy College Prep, a program that assists at-risk high school youth in Nashville with the college application process. As an Ingram Scholar, she was able to attend a wide variety of cultural events in Nashville and participated in Scholars seminars. Several of her summer internships were spent in Washington, D.C. working in the areas of social entrepreneurship, AIDS community action, and education. Stacy credits faculty mentors and help from the Vanderbilt Office of Active Citizenship and Service with supporting her desire to experience a broad range of service learning going beyond class requirements. What's next? Stacy is studying at Emory Law School towards a J.D. in public interest law to further her desire to shape public policy in education. Public/private partnership with Durham, NC for the revitalization of a downtown neighborhood. Sadie Tillery understands craftsmanship and innovation. As the director of programming for the Full Frame Documentary Film Festival, she views hundreds of documentary films every year and travels throughout the US and Canada attending film festivals. Tillery started working for the festival as an intern in college and moved here after she graduated to work on the festival full-time, eventually becoming a director. Her position puts her in contact with the best documentary film makers in the world. Now she’s taking on a new role – that of homeowner and the first person to reserve a B. Wallace Design & Construction home in Durham’s Southside redevelopment project. In a few weeks, work on her new home will start, to be followed by 47 more new single family homes. This first-phase of the multiphase neighborhood development centers on South Street, one block south of Lakewood Avenue. The city partnered with Self-Help Credit Union, acquiring over 10 acres in Southside that were largely populated by abandoned houses. The Southside new homes project is part of a larger redevelopment initiative that stretches from Roxboro Road on the east to South Street on the west. The first phase of the overall 125 acre redevelopment site includes 48 single-family homes, 198 mixed-income rental units, and 13 live-work units. To provide affordable new homes in the community, the city of Durham's Office of Community Development is offering an innovative financing arrangement for homeowners who fall below 80 percent of the Area Median Income (AMI), consisting of lower mortgage rates, grants, and other incentives. Fifty-one percent of the new homes will be sold to these homeowners with the remainder going to homeowners with standard financing. There are skeptics who question the ability of the development to change the character of Southside with its longstanding reputation for drug-related activity. But a growing group of people see this as a real turning point in the neighborhood and an opportunity to invest in a place with potential and proximity to all that downtown Durham offers. Perhaps those with an eye for innovation and craftsmanship are on to something. 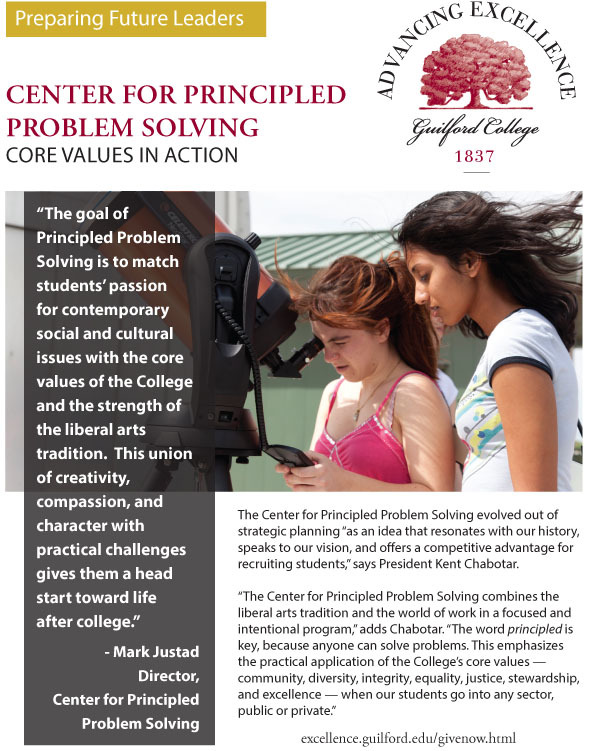 Guilford College's $60 million capital campaign public launch included this video and a campaign web site. It’s often the things admissions materials don’t tell you that turn out to be the most important parts of college life. While it’s always best to visit campus and meet the people who make Guilford special, here are four things our graduates and students say are unique to the Guilford experience. Engaged learning with an emphasis on ethics. The book Colleges that Change Lives calls Guilford a “stimulating place where the teachers care, where they expect a lot, and where they provide encouragement as well as the challenge to get young people to do things they had no idea they could do.” Our curriculum is writing-intensive and asks you to apply ethics and knowledge to real-life issues. It fosters the development of innovative leaders and communicators who excel in a variety of educational and professional fields. ­­­­­­One Guilford grad described Guilford as a place where students question answers as much as they answer questions. Self-expression and communications are important to a Guilford education. You may choose to participate in civic engagement and leadership studies through one of our leadership programs– Bonner Scholars, Quaker Leadership Scholars Program, or the Center for Principled Problem Solving. Prepare to be transformed. Building on our Quaker foundations. Our Quaker founders were people of principle. We try to maintain that principled approach. Everyone is on a first-name basis. We respect all faiths and ways of life. Acceptance, tolerance, and civility are important here. Our core values of Community, Diversity, Equality, Excellence, Integrity, Justice and Stewardship come right out of the Quaker principles. Learning and living in a diverse community. As small liberal arts colleges go, Guilford ranks near the top of its class in diversity. Not only are we ethnically and geographically diverse, Guilford students range in age and background. Occasionally you will have juniors and seniors from The Early College at Guilford, as well as adult students, in your classes, making the experience especially dynamic. Outside the classroom, you’ll share dorms and campus activities with other traditional-aged students. Our campus, location, and sustainability. We’re talking about a beautiful 300-acre wooded campus that’s well over a century old on the edge of a thriving metropolitan area (pop. 1.4 million). Unlike liberal arts colleges situated in small towns, Guilford offers internship and work opportunities nearby, along with many cultural and social activities. Guilford’s sustainability features include the largest collection of solar panels for heating water on any college campus and a small farm that grows produce for our dining hall. Students volunteer to work in the garden or simply enjoy the fruits (and vegetables) of the farmer’s labors. The garden is a small but growing part of our sustainability efforts. Piedmont Triad International Airport is just 10 minutes from campus. 50 flights a day connect you to New York, Atlanta, Boston, and Chicago. Amtrak from Greensboro gets you to Raleigh-Durham or Charlotte in no time at all. The late Eunice Kennedy Shriver was known around the world as the founder of the Special Olympics and a champion for children with disabilities. Two of Shriver's achievements, both of which have had far-reaching influence, have roots at Peabody College. Research conducted at Peabody on preschoolers came to provide the idea behind the Head Start program, while cognitive and developmental psychology research led to the establishment of the Vanderbilt Kennedy Center. Shriver and her husband, Robert Sargent Shriver, Jr., visited Peabody College several times during the mid-1960s. At the time, Sargent Shriver was the head of President Johnson's Office of Economic Opportunity. As a result of the Shrivers' meeting with Susan Gray, a psychologist at Peabody, and a visit to a Kennedy Foundation project run by Gray, the Early Training Project, the germ of the idea for a national program of assistance for at-risk children was born. The Early Training Project was an early intervention model that worked with students with below average IQs. The Shrivers saw in Gray's program a way to enhance the lives of disadvantaged preschool students in a formative period of their lives. Eunice Kennedy Shriver wrote of the experience in a first-person account called, "Inspiration for Head Start". "In 1964, Carl Haywood and Nicholas Hobbs invited me to visit Peabody College to observe their research and accomplishments, especially those of Dr. Susan Gray. At that time, Dr. Gray was conducting a study on small children with mental retardation examining the impact of tutoring with their parents upon the likelihood of these children entering into normal grades in school. As I was about to leave on my trip to Nashville from my home in Washington, D.C., I asked Sarge if he wanted to accompany me. At that time, he was organizing the War on Poverty. He seemed rather reluctant at first but he decided to accompany me. When we landed in Nashville, we were met by Dr. Gray. She invited us to view two or three different centers where the parents were working with their mentally retarded children to upgrade their skills. At the conclusion of our visit, we talked for a while with Dr. Gray. Sarge and I were impressed with her results in improving the abilities of mildly retarded children. During our flight back to Washington, Sarge turned to me and said, "If you can do this with disabled children, I could do this with regular children all across America." President Johnson authorized the Head Start program in 1964. The program was conceived as a comprehensive community action program which would involve the parents of students, community volunteers, teachers, and healthcare professionals. The goal was to lift millions of families out of the cycle of poverty through education and by addressing deficits in health care, nutrition, and parenting skills. The U.S. Department of Health and Human Services estimates that close to one million children attend Head Start programs each year. From a small seed of hope that began with Susan Gray's Early Training Project has grown a program that has impacted the lives of millions. On October 31, 1963, President John F. Kennedy signed legislation to construct a national network of Mental Retardation Research Centers. The Vanderbilt Kennedy Center for Research on Education and Human Development was founded at George Peabody College for Teachers in 1965 as one of these twelve original centers funded by the National Institute of Child Health and Human Development (NICHD). The construction on the Peabody campus of the Human Development Laboratory (now the Hobbs Building) and the Mental Retardation Laboratory (now the MRL Building) Building, dedicated in 1968, was made possible through funds provided by NICHD, a grant from the Joseph P. Kennedy Jr. Foundation, and matching funds from Peabody College. The Vanderbilt Kennedy Center was a model in its emphasis in research on education, both to improve practice and to determine the effectiveness of educational interventions. Carl Haywood, a former director of the Vanderbilt Kennedy Center remembers Eunice Shriver as a pioneer in mental health research. "She was instrumental in the creation of the National Institute of Child Health and Human Development (NICHD) within the National Institutes of Health, the institute that has been the prime source of funding for the Kennedy Center since even before the Center opened," Haywood says. "In addition, through the Joseph P. Kennedy Jr. Foundation, Mrs. Shriver stimulated research into the causes, prevention, and amelioration of intellectual and other developmental disabilities. Because of her leadership of the Kennedy Foundation, an enduring pattern of collaboration between private philanthropic organizations and academic/research institutions was firmly established and applied in many settings, with substantial benefits to citizens with intellectual disabilities, to the scientific enterprise, and to the host universities." Today the Vanderbilt Kennedy Center includes a University Center for Excellence in Developmental Disabilities (UCEDD), the Treatment and Research Institute for Autism Spectrum Disorders, a Leadership Education in Neurodevelopmental Disabilities training program, and is one of the Eunice Kennedy Shriver Intellectual and Developmental Disabilities Research Centers. The Shriver's social action and their legacy, once influenced by the work of Peabody College, now supports the work of many Peabody researchers who receive funding from the NICHD for investigations of disabilities and interventions to prevent or ameliorate them. Many schools across the nation struggle in their efforts to deal with challenging behaviors. A new book co-authored by Kathleen Lane, associate professor of special education at Vanderbilt University’s Peabody College of education and human development, aims to help schools develop a comprehensive strategy to identify and help students with behavior issues before violence erupts. The book, Developing Comprehensive School-wide Intervention Programs to Prevent and Manage Antisocial Behavior: A Step-By-Step Approach, is co-authored by Jemma Robertson Kalberg and Holly Menzies. It translates years of classroom research into a manual for school administrators and teachers wishing to create positive behavior support programs in K-12 settings with an overall goal of improving academic, social and behavior outcomes for all students. Through a series of questions and instructions, school personnel are led through the foundations of designing, implementing and evaluating a primary prevention program designed to prevent the development of challenging behaviors and respond to existing cases of problem behavior. The book includes extensive forms, resources and instructions that walk the reader through every step of the process. In addition, it offers a research-based view of the topic and details studies that examined the effectiveness of school-wide interventions designed to promote positive student behavior and improve academic performance. Lane is an investigator in the Vanderbilt Kennedy Center and the Vanderbilt Learning Sciences Institute. Kalberg is a special education teacher at Seneca Center in San Leandro, Calif., and Menzies is an associate professor of special education at California State University, Los Angeles.